Novak Djokovic’s bid for a record seventh Australian Open title came to a stunning end yesterday when the Serbian packed his bags and headed home in the wake of a second-round upset at the hands of world number 117 Denis Istomin. The 29-year-old has bestrode the blue hardcourts of Melbourne Park like a colossus over the last decade, winning his first grand slam title in Australia in 2008 and adding five more in six years from 2011. Yesterday’s 7-6(8) 5-7 2-6 7-6(5) 6-4 defeat was only his second in his last 42 matches at the year’s first grand slam, the other coming on the same Rod Laver Arena against eventual champion Stan Wawrinka in the 2014 quarter-finals. Last year, he beat Andy Murray in the final for the second straight season to match Roy Emerson’s record of six titles and, while seeded second behind the Scot, was favourite to retain it next week. The shock yesterday was not simply that the 12-times grand slam champion had lost to a journeyman Uzbek – albeit a journeyman playing the match of his life – but that he went out with so little fight. Everybody waited and waited for the explosion of emotions that would indicate that Djokovic had tapped into the iron-plated resilience that had carried him through so many potential defeats at Melbourne Park and elsewhere. This was, of course, the same court where he slugged it out with Rafa Nadal for five hours and 53 minutes to win the 2012 final in an exhibition of never-say-die tennis that would be hard to better in the annals of grand slam title deciders. 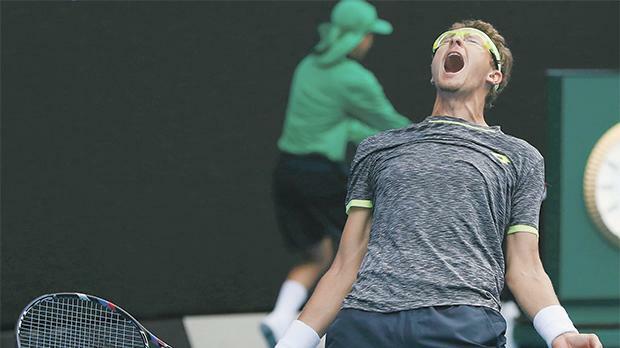 Yesterday, though, the moment never came – even if Istomin was still expecting it right up until the point that Djokovic sent a service return long to conclude the four hour, 48 minute contest. “With Novak, you never know,” said Istomin. “Even if it’s 40-Love or 40-15 on your serve, you still might not get there. I had to concentrate until the end. Djokovic paid credit to the brilliant match 30-year-old Istomin undoubtedly played, but was at a loss to explain why he had been unable to move up a gear. “In the first couple games of the fourth set, that’s where it turned around. That’s where I had to use my chances, step it up,” he said. Rafa Nadal stormed into the third round with a 6-3 6-1 6-3 demolition of former finalist Marcos Baghdatis. The 14-times grand slam champion has had two lean years at the majors but showed enough of the old passion and firepower in the two hour 13-minute clinic at Rod Laver Arena to suggest he may yet go deep in the second week at Melbourne Park. Nadal will next play Germany’s Alexander Zverev. Battling a cold and loaded up with flu medicine, Milos Raonic showed his game was still in rude health as he eased past Gilles Muller 6-3 6-4 7-6(4). The big-serving Canadian, a semi-finalist at Melbourne Park last year, was clinical on a sun-bathed Margaret Court Arena, firing 21 aces and 56 winners to despatch the Luxembourg left-hander in a tick under two hours.